What a great giveaway for holiday shopping! Good luck everyone! Love your blog and LOVE Target!!!! hope i win. really like your site. thanks. I follow you on facebook. Thanks. Cute giftcard, thanks for the giveaway! I read each and everyone of your posts. Thanks for all you do! Love the site. What a cute gift card. Would love to win it. Please consider this as my entry, I have already liked you on Facebook and subscribed to your feed by email. I would love t win this. thank you for the giveaway. We could definitely use this to buy some holiday presents! I hope I win cause I really need the extra funds due to have to get my brother’s children. Fingers crossed !!!! Love Target and Totally Target! Thank you for all you do, it’s truly appreciated!! Id love to win! This could help out a lot this year since we are expecting baby #2! 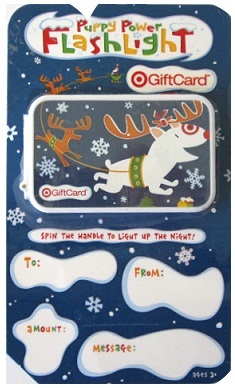 I would definitely put this gift card to a good use! I follow TT on FB and recommend it to everyone I know! Like TT on FB. Thank you for the opportunity! What a great give away. I could definitely use it. I love this card and would love to win! I love your site! Thanks for the great giveaways! I already follow you on Facebook & Twitter and Subscribe to your daily emails! I love your site and have told all of my friends and family about you! Love Totally Target! I’d use this to get some more ELF brushes.